The Houston TranStar Traffic Mapping System allows users to toggle traveler information map features on and off, view detailed maps of the Houston region, zoom in and out of specific map areas, and click on hot links to various traveler information directly from the maps. The map is available in the traditional TranStar map format or overlayed on top of Google Maps. Users have the ability to customize their view of the various events and devices that are mapped by the TranStar system. Real-time speeds and travel times, incidents, emergency road closures, scheduled lane closures, cameras, freeway message signs, park and ride lot locations, and weather radar can all be viewed on a single map. The “Map Controls” menu available on the navigation bar at the top of the map allows users to quickly toggle map items on and off. To add or remove a feature from the map, click the checkbox next to an item. Any event or item shown on the map can be clicked to obtain additional details. The system allows users to zoom in or out of specific areas in the Houston region. Zooming in allows you to view street level incidents and traffic speeds. On the TranStar map, simply click the magnifying glasses to zoom in or out , click the arrows to visit a geographically adjacent map, or click the “More Maps” menu to easily navigate between area maps. The area maps provide greater detail and contain expanded coverage of the Houston region. For an even more detailed view of TranStar information, use the Google Maps Interface which is accessible via a link on the navigation bar. To navigate the Google Maps Interface, use the built in controls on the top-left portion of the map. You can also drag the map with your mouse to pan and double-click the map to zoom. Search for specific locations using the search box at the top of the map. Embedded into the maps are “hot links” which give users direct access to other web-based traveler information. Click on the airport icons to visit each respective airport’s website or the boat icon to get current Galveston-Bolivar ferry wait times. 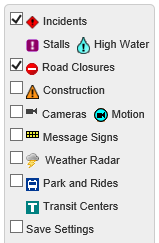 The “Statewide” map offers links to other Texas Traffic Management Center web sites. Visit the map at traffic.houstontranstar.org or the TranStar Home Page at www.houstontranstar.org.